The Webster Warmth Fall 2015 project will makes items for Room at the Inn emergency shelter for homeless women and families. Members of the Webster community who enjoy knitting, crocheting or sewing are invited to participate in the Webster Warmth Fall 2015 project. The Webster Warmth Fall 2015 project will gather items for Room at the Inn, an emergency shelter for homeless women and families. We welcome handcrafted items such as scarves, gloves, hats, etc. The deadline for turning in completed items is Dec. 7. Patterns and project suggestions can be found on the Webster Warmth website. We also welcome store-bought items from anyone who wants to lend their support. Contact Kathy Gaynor at kgaynor@webster.edu or 314-246-7811 with any questions. Send completed items for Webster Warmth to the attention of Kathy Gaynor, Webster University Library, 470 E. Lockwood Ave., St. Louis, MO 63119. In 2005, Holly Hubenschmidt, head of Instruction, Liaison, & Reference Services in the Webster University Library, coordinated a project in support of the Orphan Foundation of America. Groups on the main campus in St. Louis and the Kansas City campus made red scarves which were donated for Valentine’s Day care packages for college students coming out of foster care and entering college. The following year a different charitable recipient was chosen for the donated crafts. 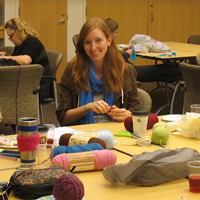 The annual project was named “Webster Warmth” and became an official Webster Works Worldwide project for faculty, staff, students, alumni and friends who knit, crochet, quilt and sew. Since then hundreds of handmade items have been donated to agencies in the St. Louis area as well as other locations in the U.S.